How did you first become involved in turtle and tortoise conservation in India? In 2016, I moved back to India from the United Kingdom in search of wildlife related jobs after finishing a degree in Biological Sciences from Oxford University. I came across an advertisement for the TSA-India program, applied, and was offered the position. Prior to that, I hadn’t actually had any experience in turtle and tortoise conservation. Since joining the team I’ve learned so much and I continue discovering more about these animals and their conservation needs as I go on. It’s been a real eye-opening experience, and I think it’s one that will stay with me in some way or another for the rest of my life. What is your favorite species of turtle or tortoise to work with there? It’s difficult to choose as each species is special in its own way, but I find myself a little partial to the Pangshura genus. I know they’re not as glamorous as the Batagurs or softshells but the Indian Roofed Turtle (Pangshura tecta) and Indian Tent Turtle (Pangshura tentoria) really call to me, especially the really cool hybridization and intergrades observed in this genus—something I can’t wait to delve into in more detail. Given that the weird hybrids are found very close to my field site on the Ghaghara River, it gives me a prime opportunity to explore research options in this area. India is a large subcontinent with many ecoregions. What is your favorite ecoregion to work in and why? India is so vast and so varied that it’s really difficult to choose an ecoregion as each one has something that makes it special. But personally, I take any chance to make my way to the Chambal region. Something about its pristine waters gives me hope that in this day and age of extreme pollution and environmental degradation, especially in a country as populous as India, there is the possibility of saving these ecosystems. It also gives me faith in the plasiticity of nature to be able to bounce back if we can manage to give her enough of a leg up. You’ve recently been involved in large seizures of turtles, tell us about your initial reaction to seeing these turtles and how TSA-India performs crisis management? 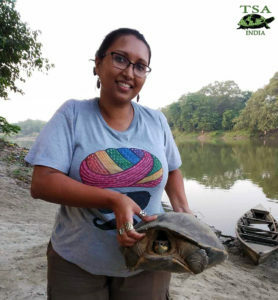 It was definitely a shock to the system—not so much the images of the emaciated animals or the conditions they are transported in (though of course those are tragic in and of itself), but more so the sheer numbers in which turtle trade occurs. With other animals you hear numbers like “ten skins” or “five horns,” but with turtles its in the thousands! 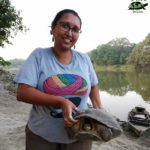 Frankly, I’m still struggling to contemplate the numbers of turtles that are out there and the amount of trafficked turtles that must get missed by authorities compared to the ones we’ve managed to intercept. What’s really effective is the expansive network TSA-India has managed to establish with various forest department officials, such that the moment a consignment is seized, we’re usually the first ones to get a call. Because of this, we can rapidly and correctly instruct those at the site of seizure on how to provide triage and treatment. Our rescue team also travels day and night to make it to these seized consignments of turtles so that we can support governmental staff in providing treatment and care. I really think this makes all the difference in reducing the initial mortality rate. This winter, we’ve seen a large increase in the amount of Flapshell Turtles being trafficked. Although listed as “Least Concern” by the IUCN, what impact could this level trade have on the species? At some point, every species who is now threatened with extinction started off as being “Least Concern.” This resulted in the cavalier attitude of illegal traders as well as conservationists in attempting to save them. It’s only when they get to a threatened status that everyone jumps to action and begins to understand the urgency in saving them. But, I think this is the wrong way of going about it; why wait until we’re right on the edge? More than 7,000 turtles intercepted from illicit trade in just over two months is not a small number, and this is only what we know of. Looking at the scale of trade in this species and the fact that action is not being taken quickly enough, in a blink of an eye this animal is going to become highly threatened. And, with other species already on the brink, I feel that a lot of the ecological load is being carried by this generalist species—the loss of which could topple the whole ecosystem like dominos. What attracted you to become part of the Turtle Survival Alliance? Like all good things that have happened to me, this too happened on a bit of a whim. I trusted my instinct and joined and within a few weeks realized how special the Turtle Survival Alliance truly was. I remember reading about the TSA and felt like a veil had been lifted—I’d been introduced to this whole new aspect of conservation which I don’t think a lot of people talk about. I myself have now started discussing it more with friends and family and they too have become more aware of freshwater species and the threats they face. What I like best is the level of commitment that every single person in TSA and TSA-India has towards turtle and tortoise conservation. To someone like me, its inspiring and continues to push me forward when I start to find myself becoming cynical or dejected. What advice would you give to an aspiring chelonian conservationist? Ask questions—we are more than excited to talk turtles! While information is readily available in textbooks or online for more popular species, specific chelonian information can be a little difficult to come across in literature. Most people I speak to generally make the same comment that they had no idea about any of these issues and wish someone was there to tell them more. So, I’d definitely recommend to always feel free to contact those who are already deeply involved in chelonians and their conservation for any further information. And, most people I have spoken to within this field have never turned me away or not responded, which I think is a really nice quality amongst chelonian conservationists!